At IFEMA, on the morning of September 5th, the first 5G prototype R&D lab for the tourism and trade fair sector was launched: the IFEMA LAB 5G. It is a research hub set to develop solutions, features, and new services using 5G technology to be displayed at FITUR 2018. During the research team's welcoming ceremony, IFEMA's CEO, Eduardo Lopez Puertas, highlighted IFEMA's vision to become a reference point for innovation, providing both exhibitors and the public with a high-quality and practical experience in its aim to identify future opportunities for 5G technology in the tourism and trade fair sector. 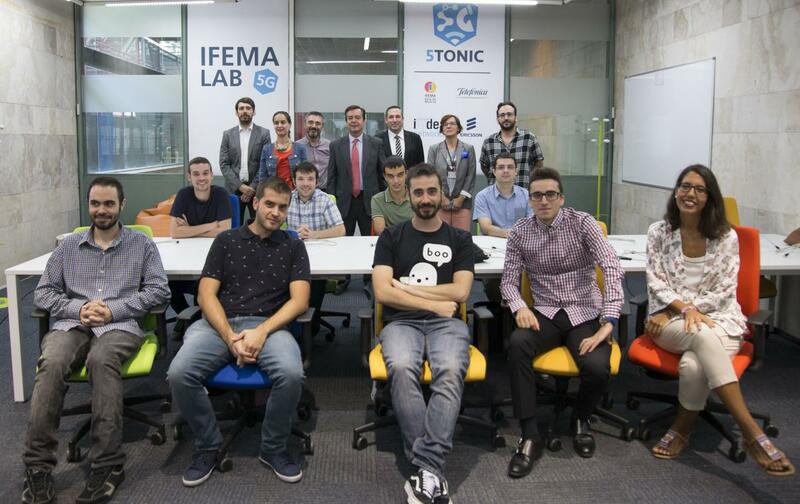 Creating the lab was made possible thanks to IFEMA's partnership with 5TONIC, an entity funded by Telefónica and the IMDEA Networks Institute, of which ERICSSON is also a member. IFEMA LAB 5G's research team is comprised of 10 students from various engineering backgrounds selected by and on scholarship through Talentum, Telefonica's platform to boost young talent. Rosalía O'Donnell Baeza, Head of Telefonica's Talentum, stated the importance of embarking upon digital innovation projects using young people's contributions and offering solutions that realistically respond to social and technological progress. Considering this, as pointed out by the Director of FITUR, Ana Larrañaga, focus is currently set on FITUR January 2018 and the challenge of showing the first 5G prototypes to professionals in the tourism sector. 5TONIC's representative, Ignacio Berberana, underlined the importance of the R&D lab's presence in IFEMA, as it brings 5G technology closer to end clients. He also highlighted the importance of Ericsson's web infrastructure that will allow the research team to carry out development testing. The welcoming ceremony closed off with remarks by Adan Levy, mentor for the R&D lab's students, who placed emphasis on the lab's goal to offer highly innovative 5G solutions and uses. IFEMA's decision to implement this innovative project aimed at identifying, creating, and launching value-added use cases powered by 5G across industries is in line with IFEMA's role as one of the main trade fair operators. Also, its leadership role within the tourism sector is reflected in organizing the International Tourism Fair in Spain, FITUR. FITUR 2018 will enable research and development of new services in numerous facets of the tourism and trade fair sector that use Cloud, Big Data, AI and 5G technologies to create limitless user experience before, during, and after attending IFEMA's trade fairs. Currently, 5G technology is still in its experimental stage and only used at the prototype level for certain industries. However, 5TONIC's research (a pioneer in the European market) looks to put in place the extended use of 5G products in various industries and also tests their viability. These 5G products are set for widespread implementation from 2021 onwards. In fact, currently, there are large international working groups focused on defining use cases and solutions that foment digital innovation using 5G technology and looking at their effect on the Manufacturing, Automation, Transportation, eHealth and Security sectors, among others.